This fabric line has been discontinued. 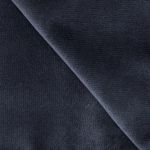 Please see "Related Items" below for our 24.5 ounce Velour alternative. Our 21 oz. Velour drapes are a preferred choice for the classiest events and theatrical performances. Our 21 oz. Velour drape is Inherently Flame Retardant (IFR) and passes the NFPA 701 fire code. Each drape measures 94 inches tall x 52 inches wide. Edges are serged. I ordered online then followed up with a phone call - the rep couldn't have been nicer or more helpful. The drapes are well made and arrived quickly. I am using them to separate two spaces. They do not let through any light. The sound between the two spaces is muffled but not blocked.